Senyawa is an experimental band from Jogjakarta, Indonesia. Senyawa embodies the aural elements of traditional Indonesian music whilst exploring the framework of experimental music practice, pushing the boundaries of both traditions. Their music strikes a perfect balance between their avant-garde influences and cultural heritage to create truly contemporary Indonesian new music. 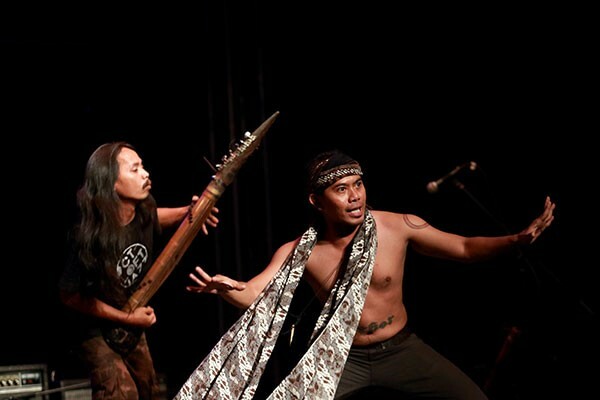 Their sound is comprised of Rully Shabara’s deft extended vocal techniques punctuating the frenetic sounds of instrument builder Wukir Suryadi’s modern-primitive instrumentation. Inventions like his handcrafted Bamboo Spear; a thick stem of bamboo strung with percussive strips of animal skin alongside steel strings. Amplified it fuses elements of traditional Indonesian instrumentation with garage guitar distortion. Sonically dynamic, the instrument can be rhythmically percussive on one side whilst being melodically bowed and plucked on the other. Senyawa have performed at many notable festivals and underground clubs such as MONA FOMA Festival in Tasmania, Adelaide Festival, and many more. They have collaborated and performed with a huge number of artists like-minded and influential artists. In 2012 they completed a film in collaboration with French filmmaker Vincent Moon.